The work of just one man, Israeli-born and now London-based Tom Treivish, Protomythos is a very personal project. Its first album, 2013's In Human Sight, was a concept album based around human perception of animal suffering and although Heavy Crowns seems to lack a unifying theme, it's a heavier album taking more influence from the likes of Porcupine Tree and Opeth, not to mention Dream Theater. Oh great, you say, yet another prog metal band sounding like three of the genre's biggest! But Protomythos does more than enough to stand out, not least for the songwriting, which manages to stride a fine line between riff-fuelled rocking and more melodic or melancholic moments. Opener Walking the Plank is a strident example of the former, pushing the keyboards back to a supportive role and easing the listener in with a relatively straightforward grooving rocker that makes good use of its six minute running time, spicing things up with a promisingly dark melodic interlude atop wordless vocals before returning to the riffing. There are issues immediately apparent; the mix, for one, which leaves the vocals a little behind the rest of the instruments, particularly the guitars. Yet the instrumentation is expert if unflashy (including Chris Allan's drums) and Treivish has a pleasant voice that makes the balladic Fragile Fallacy and the slow-building Bitter Truth quite lovely; there are moments where he almost sounds like Ulver's Kristoffer Rygg. The attempts at harsher whispered vocals here and there should probably have been left to another, although they're certainly not bad. And your focus will probably be on the music anyway, as there's much to focus on. It's definitely not as straightforward an album as first listens may appear; the almost Middle-Eastern melodies that pop up in Bury Your Head are reminiscent of the eternally underrated Subterranean Masquerade, for example, and they're tied in well with the heavier riffing. 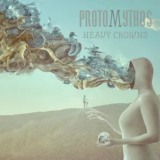 Every prog band seems to experiment with electronics at some point and Protomythos are no exception, but they're a welcome addition to the quirky Evolve and aren't allowed to overwhelm, the (synthesised) strings later in the track more noticeable. It would be easy to criticise Heavy Crowns for being a little predictable; after the slower, more melodic duo of Fragile Fallacy and Bitter Truth you expect a heavier rocker and Flip of a Coin duly delivers. Still, you can hardly blame Treivish for mixing things up, and the album not only flows well, it keeps the quality levels up too. The Candle has a near-(older)-Opethian feel to the riffing before closing epic A Shadow Play brings the band's heavier and lighter sides together with a nine-minute song that could have come from Dream Theater around Train of Thought; driven by heavier, post-Metallica riffing coupled with some spacey melodic guitar plucking, not over-reliant on the instrumentation to deliver the hooks and seeming much shorter than its running time. It sums the album up well, enjoyable, rewarding, and certainly worthy of your time. Far too good not to be represented by a label, Protomythos samples (and pre-orders) can be found at the band's Bandcamp page.